Despite the swirling controversies that still haunt the nation about the Vietnam conflict, major advancements in medical services emerged from that era and are still employed today saving thousands of military and civilian lives. Call it one of the ironies of the destructive nature of war. The effectiveness of the medical system in Vietnam can be viewed as a whole by comparison of ratio from Killed In Action to surviving wounded. In WWII the ratio was 29.3%, in Korea 26.3% and in Vietnam 19% and an astounding 42% of Americans wounded in Vietnam were able to return to active duty. There are three contributing factors that accomplished this feat: 1) The rapid evacuation and treatment of the wounded 2) the quality of care the wounded received and 3) the insight of the medical personnel to adapt to the nature of the conflict and it’s weaponry and the challenges that the country of Vietnam presented. M.A.S.H. units (Mobile Army Surgical Hospitals) used in the Korean War were not practical for the jungles of Vietnam. M.A.S.H. units travelled with the fight, but Vietnam was a different kind of war. “Front lines” were practically non-existent. This was jungle fighting or guerilla warfare with many battles being relatively small incursions and exchanges were sporadic and unpredictable. In terms of medical treatment, the response needed to be fast. The MedEvac helicopter, most notably the Bell UH-1 Iroquois or “Huey” was the primary tool used to retrieve a wounded soldier or Marine. 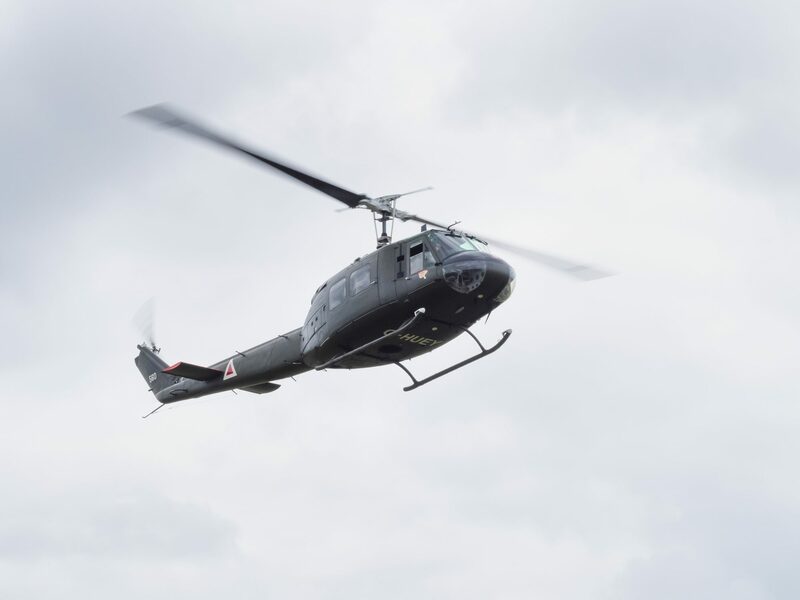 Though the origin of air evacuation via helicopter started in the Korean War, it wasn’t until the Vietnam conflict that it’s prolific use came into being. In a country that consisted of mountains, valleys, waterways, rice paddies and very few manageable roads, those in charge quickly realized that ground transportation would be extremely limited. For a wounded soldier, doctors were discovering that there was approximately a 6 hour window after injury or what they refer to as the “golden hours” to treat a wound before the soldier went into shock or cardiac arrest. In fact this discovery led to the advent of Trauma Centers in many urban hospitals, complete with heliports. The “Huey” and other helicopters were often able to evacuate and deliver the wounded within thirty five to forty minutes to a forward hospital. In comparison, the average medical evacuation time in Korea was 4-6 hours. Usually the soldiers were well bandaged and/or splinted by the excellent medics in the field and the “air ambulance” was fast, the ride relatively smooth and in some cases a preliminary diagnosis could be radioed ahead. In 1969, the peak year for medical evacuations, over 200,000 casualties were transported by air. The speed and efficiency of the air evacuation system in Vietnam saved countless lives. The medics or corpsmen of Vietnam, upon returning to the United States were the first to enroll in “Physicians Assistants” training programs at Duke University in 1965. The other medical developments made were achieved on the operating tables, whether they were in the field or a hospital. It was those “golden hours” where most of the advances occurred. Surgeons, nurses and anesthesiologists were discovering new techniques in the area of trauma, repair and blood supply in an effort to save life and limb. In the field, the corpsmen were offering very advanced and often life saving service to wounded soldiers. These men opened surgical airways, performed shock resuscitation and more, often under fire. From this was born what is now the modern EMT or paramedic. On a more humorous note, these corpsmen also employed the use of what is now called Krazy glue, Super-glue or Eastman 910 to bind certain wounds. Though this skin adherent, known as Cyanoacrylates was invented really by accident in the early 40’s, the inventor, Dr. Harry Coover made the adhesive available to the military in spray cans. Though it wasn’t approved by the FDA for such use until decades later, corpsmen and military surgeons used it anyway when time consuming stitching wasn’t an option and they needed to stop the bleeding or even close wounds. Overall it was the medical staff, the pilots and the men in the field and their ability to quickly observe and adapt to the unique type of conflict and its environment and enlist these new techniques and technologies that produced definitive medical results that play a major role in modern medicine today. As a testament to the life saving capabilities of those who served, there were 8,744,000 U.S. service members on active duty between 1964 to 1975. Forty-three years after the conflict ended there is an estimated 7, 391,000 Vietnam Veterans living today. Most of these veterans are now 60 to 80 years old. Some have suffered debilitating injuries and due to their age may struggle with daily living. Thankfully there is relief from the V.A. Aid & Attendance benefit. This is a tax free pension for senior vets and their spouses to help reimburse for long-term care costs like home care, assisted living, skilled nursing and more. If you are a veteran of WWII, Korea or Vietnam, or you know someone that fits this criteria and is in need of what is referred to as an “enhanced pension” to reduce the financial burden of long-term care, please contact American Veterans Aid for information.